From Wholesaling to Brand Building! Bangalla offers specialized wholesale distribution services to business customers across the US and Canada. From our growing network of distribution centers across North America, Bangalla provides fast and efficient logistic services to best support your business. At the most basic level we offer wholesale access to over 20,000 items that can be shipped directly to our trade/commercial/wholesale customers anywhere in the world. Our product range includes over 500 brands in over 100 categories built up over 15 years in working with leading manufacturers and supplies the world over. 1) Great prices with volume discounts and special offers available. 2) No minimum orders per month or per delivery. 3) Split cases or singles available on many items. 4) Various shipping options available. 5) Large range New products during the year. 6) Items shipped under your name. 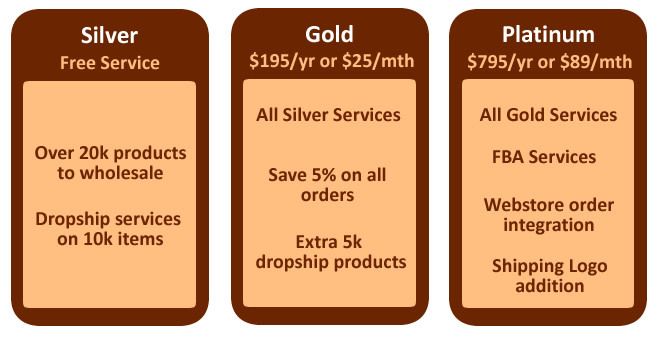 For customers looking to really expand their ecommerce services or looking to really drive down the price of their orders, then gold membership is the way to go. For an annual fee of $195 (or $25/mth), gold members save 5% on every order they place and have access to an additional 5k items to list on their online platforms. For those with more advanced integration and FBA needs, then our Platinum program offers great value. However, for many customers they want the ability to add their logo on a range of items and hence build their own brand in the market. Bangalla's Brand Builder program does just that. We design the packaging with your logo, we provide access to marketing services to help get your brand started plus we pack and ship all items on your behalf. Check out the Brand Builder program for more details. Please contact us for more details on any of our programs.